Of course I collect galvanized buckets and went outside right away to make sure I had all the buckets I needed and of course I do!! This one is from Annie Steen Pondside Primitives. Here is how she had it before it was planted. 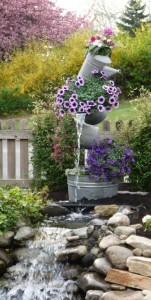 This Tipsy Garden Planter is from Jeanne Sammons. Here is mine and how I got it set up. First I put a galvanized tub on the bottom that had the bottom rusted out. We put a starter hole in the ground to put the pipe in, then pounded in the pipe about 18 inches- 2 feet into the ground. I used is a 1″ electric conduit steel pipe that I got for free from my cousin-in-law (Thanks Tim!) who is a contractor and of course always throwing out all kinds of great useful stuff! I drilled holes in the buckets, ran a pipe through the bottom tub into the ground and stacked the buckets. 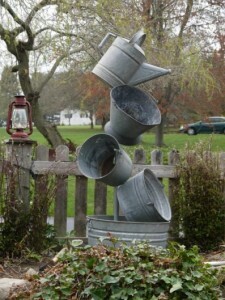 The buckets are leaning against the center rod. 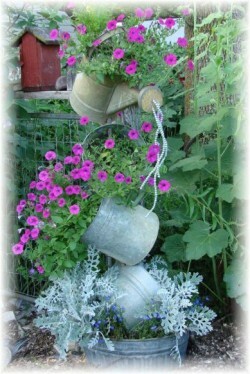 Of course make sure your buckets are at an angle and not completely tipping or your soil and plants will fall out. 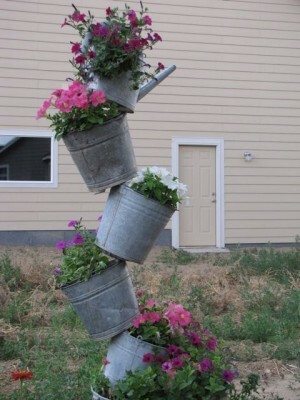 This is how my planter turned out. I put bad soil in at first and then had to take out the plants that were dying and replant it. Now that it’s finally taking off and I love looking at it out my kitchen window. It will be gorgeous next year next to the white fence when we get it up. What type of adhesive do you use to hook them together? Hook what together? If you mean the buckets it’s just a pol going up the middle of each bucket and they put them on a slant. 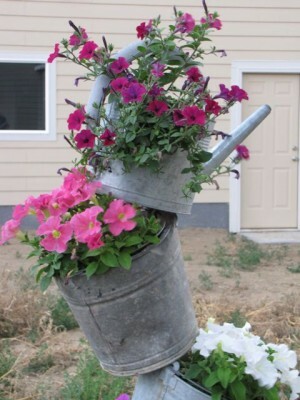 This would be a great way for someone who doesn’t have a yard to still have a nice flower garden. I can just picture this sitting on someone’s patio in a small apartment complex. How beautiful. Yes, when we lived in apartments this is what I did. All containers and it was beautiful! how do the buckets stay up on the pole? Are they anchored in any way?